With regards to the lack of suitable clothing for those in the Gulf. Back in January at a militaria show in the UK, issue desert trousers and jackets were on sale for £20 a set. They are still available. Currently dealers are selling issue desert boots, brand new government surplus stock at £44 a go. You can even get desert NBC suits again brand new. I'm sure I'm not the only one scratching his head wondering how its being flogged off as surplus to requirements when it is obviously still required! Perhaps questions will be asked? If you are after the stuff there is a magazine called by the jolly name 'Gun Mart' carrying adverts for this sort of kit. I paid a visit to Northolt two weeks ago. For those seventies and before movers, there is now a new shiny new terminal on the Southside, otherwise things have not changed much but the trip was a nice waft of nostalgia. Oh and yes, the locals are still complaining about the noise- well don't live next to an active airfield. After all its been there since the First World War!! I read recently on the "Servicepals" website that servicemen & women (some 200,000) are to be recognised by the presentation of a GSM for the Suez Crisis nearly 50 after the event. As you know I'm into the "Aden thing" at the moment. Egypt, I believe, was very much anti-British in the Aden conflict. The article went on to say the dispute between Britain & Egypt was over demands by Egypt that Britain should evacuate a major military installation. What I would like to know is what was that installation? (possibly a Naval base?). Have any of our more senior members got first hand experiences of the Suez Crisis? Any info would go a long way to furthering my education on the "Aden thing" and would be greatly appreciated. Is there a website on Suez? Anybody know? Thanks Tony, I look forward to responses from members. Nasser emerged from the Suez Crisis a victor and a hero for the cause of nationalism. Israel did not win freedom to use the canal but it did regain shipping rights in the Straits of Tiran. England and France, less fortunate, lost most of their influence in the Middle East as a result of the episode. The Crisis marks major shift in the power relations of the western Europe, signaling the rising importance of cold war politics in international crises, and the continuing decrease of Britain's influence as a colonial and imperial power. Following is an e-mail I received from John Cooper who had the unfortunate experience of doing a 'wet' landing in a Hastings in the sea off Gan. Perhaps you could include this in the next Briefs to see if any of the guys from our era can throw any light on what John is looking for. Personally, I know that there was a continuous shuffle of aircraft to Australia and I also know that many pieces of freight were marked AWRE. Whilst at Changi on pax handling, a fair percentage of pax were civilians who were obviously working for AWRE and going over for the A tests. Whether in fact the cargo contained any 'nasties' I will never know. At least I've still got 2 of most things and everything is still in working order! I also believe Christmas Island figured in the A-testing back then or was it simply a staging post on the route to Oz? Our government is still trying to get the POMS to clean up the after affects of the A tests and remove the radioactive waste that litters the Woomera and Maralinga areas. No luck so far. The miserable tight wads won't even index our UK pensions for which we contributed for all the years we worked in UK and in overseas service. What you get in year one when qualified. is all you'll ever get - no cost of living increases as they get in the UK. Sorry - rant over !! Back then, they did not have the understanding of the long term effects of exposure to radioactive material, or if they did they weren't letting on. I am still glad that I didn't volunteer for the "search for the common cold cure". We were often asked if we wanted a 'holiday' for a couple of weeks at Boscombe Down (I think?). I have no knowledge of the diplomatic mail arrangements but I seem to recall a "safe hand of pilot" situation which may have been the diplomatic mail. John Holloway , Dennis Martin and Peter Brown may be able to offer some information from their experiences at Lyneham or down route. Keep them Briefs coming mate, I look forward to Fridays each week. I recently organised a reunion at Duxford for RAF Gan and RAF Negombo bods from 1957-1961 where 32 of us attended plus wives, friends etc making 40 in all. One of the visitors was a Flight Lieutenant from Gan that was on the island as duty officer and i/c Signals Section when my Hastings I was on plunged into the sea with the undercarriage down, as you probably recall we all survived. He either deliberately or inadvertently dropped a clanger in front of 40 of us by declaring ' Of course there was no dental equipment on board that Hastings, it was carrying nuclear material for Christmas Island' (the latter we think should read Woomera). This same subject has come up several times, especially when I was asked about 'sensitive cargo' being carried on said Hastings on a live radio interview Sept 2002. 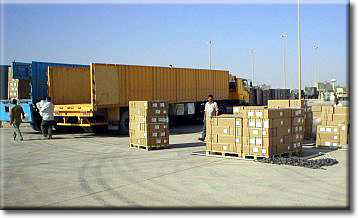 I am asking for your help Jim, in your experience as an Air Movements bod would you or any of your readers had any dealings with the loading of 'sensitive' cargo that may have gone to/ from Woomera/Maralinga especially on Hastings aircraft and would that 'sensitive' cargo be mixed with pax/freight on board. What also was the procedure for loading 'diplomatic mail', was this ALWAYS in bags? I don't know whether Tony Gale would be able to help, it may have been a little before his time on UKMAMS. What do you think? Air Marshal Brian Burridge, currently Deputy Commander-in-Chief Strike Command, will assume full command of Strike Command on 31 July 2003 in the rank of Air Chief Marshal. This follows the decision of the current Air Officer Commanding-in-Chief, Air Chief Marshal Sir John Day, to leave the Royal Air Force this summer. The new Deputy Commander-in-Chief Strike Command will be Air Vice-Marshal Glenn Torpy on promotion to Air Marshal. He will take up his appointment on 18 July 2003 having been Air Officer Commanding No 1 Group since March 2001. 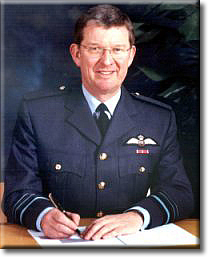 Air Marshal B K Burridge CBE RAF joined the RAF as a University cadet in 1967. A pilot, his operational background is in the Maritime Patrol role. 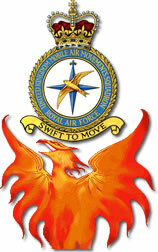 He commanded the Nimrod Operational Conversion Unit (OCU) 1986-88 and RAF Kinloss, Morayshire, during 1990-92. He has also completed a number of tours as a flying instructor including command of Cambridge University Air Squadron. His first staff tour as Personal Staff Officer to the Air Officer Commanding-in-Chief. Between 1992-97 he held senior posts in the Ministry of Defence before promotion to Air Vice Marshal 1998 and taking command of No 11/18 Group with operational control of the RAF's air defence, maritime and search and rescue forces. After serving as Commandant of the Joint Service Command and Staff College from January 2000, he was appointed to his present RAF post in February 2002, also assuming the role of Commander of NATO's Combined Air Operations Centre 9, based at RAF High Wycombe. He achieved a number of senior management and defence qualifications during the 1980s and 90s, and remains a keen hill-walker and mountaineer, having been a member of the RAF Mountain Rescue Service team which successfully climbed Everest in 2001. The two attacks on British troops in Iraq on Tuesday of this week, one of which resulted in six deaths, announced that the occupation of the country has taken a nastier turn. They may presage more deaths. They certainly warned that British self-congratulation on the success of its occupation policies was optimistic. It has become a catchphrase of American strategic policy that starting wars is easier than ending them. As the Pentagon puts it, the real difficulty is not war initiation but war termination, and the discovery of an "exit strategy". The US armed forces came to this view because of their experience in Vietnam, where extricating half a million troops from the conflict proved almost as difficult as fighting the seven-year war. The problem of war termination is comparatively new to Western states. Traditionally, wars between sovereign governments were ended by the victory of one over the other, which had to surrender and accept a peace settlement. Armies obeyed their respective political authorities, while populations usually lacked the weapons to sustain the struggle even if they wished to do so. The first notable alteration of this arrangement came in 1870, when the French people refused to acquiesce in the defeat of their army by the Prussians and, after the flight of the discredited Napoleon III, armed themselves out of the government's arsenals and continued the struggle. The people's war of 1870-71 was an isolated incident - though it helped to explain the harshness of German occupation policies during both the First and Second World Wars. The Germans were outraged by French popular resistance, which they denounced as illegal, and used to justify their policies of reprisal and deportation both in 1914 and after 1940. The obverse of German repression of popular resistance to defeat in the field was German acquiescence in surrender. Both in 1918 and in 1945, the defeated Germans accepted the verdict of battle, disbanded and returned home as soon as armistice or surrender terms were signed. There was no resistance, but rather a swift return to civil order, in 1945, under the occupation forces of the conquerors. Both British and Americans accepted this outcome as the norm. Outside Europe, however, it had rarely been the case. Wars of empire, even if apparently ended by outright conquest, all too often resulted in protracted post-war strife. The Americans found themselves involved in pacification operations in the ex-Spanish empire, both in the Philippines and the Caribbean, for years after their victory of 1898. For the British Army, pacification in the colonies became a way of life, in India, Africa and the ex-Ottoman empire year after year. That was particularly the case in ex-Ottoman Iraq after 1918. Then, as now, Iraq was a region of distinct ethnicities - Kurds, Sunni and Shia Arabs - each of which sought self-rule. The propertied class, particularly among the Sunni, resented the imposition of foreign government, all the more under a Hashemite king who had no historic link with his new domain. There was a revolt in 1920, which required the deployment of three divisions, almost the size of the current occupation force, and resulted in 2,000 British casualties. The British solution to Iraqi disorder was twofold. First, London experimented with a policy of "air control", using the RAF to bomb dissident tribesmen into obedience. Second, it created an internal security force drawn from the Iraqi minorities, a conscious policy of "divide and rule". The Iraq Levies, set up in 1922, consisted of separate units of Marsh Arabs from the south, Kurds from the north and Assyrians. The Assyrians, refugees from Turkey, were a Christian people without friends. They were detested by the Turks as rebels and disliked by all local Muslims because of their religion. They nevertheless made excellent soldiers and, under British officers, maintained the peace. Meanwhile, the British were also creating a native Iraqi army, largely recruited from Arabs who had served in the old Ottoman army. After 1930, when Iraq became nominally independent, it assumed responsibility both for external and internal defence. Nevertheless, the levies remained in being and were used by the British to sustain their authority in the country, notably in 1941 when Iraqi army officers attempted to arrange an alliance with Hitler. Post-Ottoman Iraq has never been an easy country to govern. Only under Saddam, who sustained his tyranny by terror, has rule from Baghdad been country-wide. Even so, both the Kurds and the Marsh Arabs gave him frequent trouble. The current situation therefore perpetuates a pattern that has persisted since 1918. What is remarkable is that, so far, there have been so few casualties among the Anglo-American forces. It has been complacent of the British to believe that their relaxed method of internal policing would spare them losses. True, the British are good at internal security and are experienced in that role. That is not a guarantee, however, that the Iraqis will love them. Whitehall, Westminster and the Ministry of Defence should have taken more account of history. The Iraqis have twice rebelled against British involvement in their domestic affairs, in 1920 and 1941. There was no reason to suppose that they would not do so again. What is now needed is that "exit strategy". It cannot be found either in the previous British experiments with "air control" or "divide and rule". For one thing, there are no Assyrians left. The whole community emigrated to America 50 years ago. A better solution is that of recreating an Iraqi national army, as the British did in the 1920s. There is plenty of raw material - the 200,000 unemployed soldiers at present not under orders and only erratically paid. Their discontent is fuelling the disorder. It must be a matter of priority to enlist as many as possible, give them Western training and use them to replace the American and British soldiers patrolling the cities and countryside. That programme will take several years until it is completed. Casualties among the Western occupation forces will, meanwhile, continue. I heard today that a US ex military guy is giving a talk at an RSL (Returned Services League, similar to British Legion) The subject is the Gulf War syndrome. He was interviewed on 'Auntie' ABC radio and some of the statistics he mentioned in relation to the US were frightening. Something like 180,00 out of a total of 560,000 US servicemen who served in the first Gulf War are now on disability pensions and 60,000 are already deceased. The article below just shows how the military of all coalition countries are trying their damndest to deny that this illness exists. No doubt this recent High Court finding will open the floodgates for veterans claims. It would appear that the finger is being pointed at the injections and vaccinations being pumped into the people to "protect" them from anthrax and other nasties. Britain's High Court has effectively confirmed the existence of a Gulf War syndrome, granting a soldier a pension for ongoing medical problems resulting form the conflict. The British Ministry of Defence failed to have the decisions of two lower courts overturned. Shaun Rusling, a former medical officer with the British Parachute Regiment, was angry it had taken so long to have his condition acknowledged. "It's been a roller coaster," he said. "I mean, every time I've won my case the Ministry of Defence have appealed it. Now today was the last chance and they've lost that one. I've won my case three times now. How many times do you have to go before a court to prove the problems you've got from service for your country?" I am pleased to inform you that following the safe arrival of my new Kiwi Grandson (ATA 2200, NZ Time, 14 June 03), I (and her who must be obeyed) will be visiting the Antipodes - NEXT WEEK!! Hence direct communication to all down under, rather than thru the web-site, but post this Tony - just in case. 28th June - Depart VIE on Lauda Flt OS3001. 29th June - Arrive Sydney STA 1515 local. Night stop either Marriott Hyde Park, or Ibis Airport Hotel - I'll try to confirm on Friday. 30th June - Depart SYD on Qantas QA043 STD 1045. ETA Auckland 1540. In NZ for next 2 weeks based at Rahetihi on the North Island. 15th July - Depart AKL on Qantas QA120 STD 1540. ETA SYD 1705. 15th, 16th, 17th Remaining in SYD and environs again either Marriott or Ibis. 18th July - Depart SYD on Lauda OS3002 STD 1655. ETA VIE 19/0610. All times subject to Murphy's Law, as I am on a Staff Freebie (civil equivalent of Indulgence Flight), and subject to offload, but fairly confident due to SARS. So, being quite aware that Perth is a mile or two from Brisbane and the Gold Coast, it would be remiss of me not to let you know I'll be in your neck of the woods, and although I don't believe I have met any of you, it would be great to do so, and have a wet or two. I was also hoping to meet up with an old mate from 50th Entry Brat Suppliers - Connor Nannery - he's now a Wing Commander in the RAAF - but he can't make it up from the Melbourne region. Davey - hoping to get to Wellington for a look see - is the number on the web site current??? Jack - been looking at the map, you seem to be about 500 miles from SYD as the crow flies, so that will be a toughie also. Anyway - I hope I'll meet up with one, some, or all of you - get back to me - I'll be here at work until about 1200 Zulu on Friday, from then on you'll get an 'out of office' reply, but I will be checking my e mails periodically whilst I am away. The pensions of more than 450,000 Britons who live abroad will continue to be frozen after a Court of Appeal ruling this week. Judges rejected a claim by Annette Carson, 62, an author who lives in South Africa, that the Government was discriminating against Britons abroad by refusing to uprate pensions in line with inflation. The Government has already conceded that it is illogical that pensioners living in Europe and America get the increase while others, such as those in South Africa, Australia, Canada and New Zealand, do not. About 900,000 pensioners live abroad and fewer than half receive upratings. The Government claims that it would be too expensive to upgrade all pensions. Had Miss Carson won her case, it would have cost the Government an estimated additional pensions bill of £390 million per year. She was ordered to pay the costs of the action both in the appeal and High Court and was refused permission to take the case to the Lords. Her lawyers said legal fees would come out of a fund set up by pensioners to fight the case but that the £71,000 available had now been used up and the legal battle was at an end. Miss Carson spent most of her working life in England and, when she moved to South Africa, she paid voluntary contributions to protect her right to a British state pension. She receives a British retirement pension of £103.62 a week, made up of a basic £67.50, additional Serps pension of £32.17 and graduated pension of £3.95. She has not received the increase in the basic retirement pension of £5 paid since April 2001 nor the percentage increase in pensions. In his judgment yesterday, Lord Justice Laws acknowledged: "There is no doubt that the overall position as it stands today is a haphazard consequence of events." From her home in Ladysmith, a small South African village, Miss Carson said: "I am absolutely shattered for the pensioners who are most deprived. The ones who are really in dire straits who had been hoping to get their paltry amounts increased. Many are receiving less than £10 per week through no fault of their own." One 95-year-old British pensioner, who lives in Australia, receives just £6.75 each week having started to draw his pension in 1972. But the judge said that the Government's raising of the basic state pension is a decision that is "entirely geared to the impact on the pension of price inflation in Britain". For pensioners living abroad, there were issues such as variable exchange rates and inflation. "There will be, if I may be forgiven a jejune metaphor, swings and roundabouts." If it were awarded to all pensioners, this could have "random effects", he said. The Department for Work and Pensions said: "This judgment confirms our belief that the Government is not required to up-rate pensions to those living abroad where there is no legal requirement to do so or where there is no reciprocal arrangement in place. "The Government's priority is to help the poorest pensioners living in this country and it will continue to help them so that they are able to have a decent income in retirement." Mervyn Kohler, head of public affairs at Help the Aged said: "This may be legal justice but it does not feel like natural justice. We all subscribe to the view that we pay our National Insurance contributions to get a pension but this is not the case if you retire abroad." A statement from Age Concern said the decision would mean that many on frozen pensions would continue to live in hardship and it could limit the choice of where people spent retirement. "We would strongly urge the Government to continue looking at ways of resolving this issue and making sure that people who paid National Insurance contributions get a pension that is uprated in line with inflation." Miss Carson said she was considering returning to Britain but never as "a benefits case". 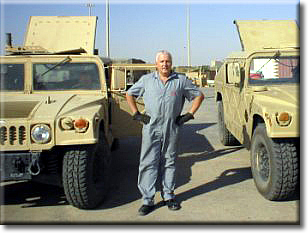 I have enclosed some photos of my recent trip into Baghdad, we were carrying 40 tonnes of rehydrating salts for UNICEF. Even although Saddam Hussein Int'l has been open for a few weeks now, the USAF handling leaves a lot to be desired. We taxied into the cargo ramp, about 1/4 mile from the main ramp that has the wrecks of Iraqi Airways aircraft scattered around. The marshaller put us into a slot that the K-loader could not get into so we had to start up and reposition. 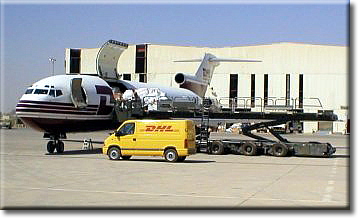 It was then another 30 minutes before the K-loader actually arrived at the aircraft, and then the ariel port staff only provided us with 2 guys, one each to drive the K-loader and large forklift! 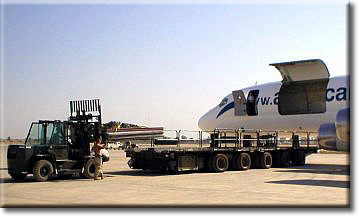 Myself and the UNICEF drivers eventually offloaded the aircraft in about 30 minutes. Considering this is now regarded as a main airhead, the handling lacks the professionalism that Jerry Allen mentioned in his last missive about UKMAMS at Basra. The USAF obviously have their priorities elsewhere as there was a Burger King set up and operating next to the terminal! Traffic there is still reasonably quiet as we had a hydraulic leak on start up and ended up on the ground for 8 hours, during which time three C5's came and went plus a DHL B727 (mail run to Bahrain), a UN B737, a Belgian AF C130 (the crew were wearing flak jackets and helmets, and did a "Khe San" approach and take off), also a couple of Russian aircraft; an IL76 and AN12. The US Army are still very nervous and travel everywhere armed and wearing flak jackets and helmets. There are "Hummers" with machine guns mounted and manned everywhere. The reason for this became clear when just as the UN B737 touched down there were 2 loud explosions and smoke rose about 50 meters from the far side of the runway. 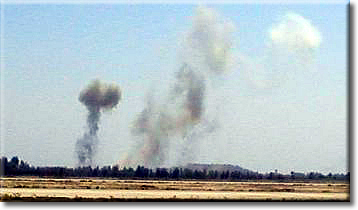 We found out later that Iraqi hardliners had fired a couple of mortar rounds at the airfield! In it's heyday the airport would have been very impressive as it covers an area much larger than Heathrow, and has 2 large presidential palaces within it's boundary. This is the second flight that we have operated into Baghdad - Mike Rowan was the loadmaster on the first flight last week. RAF Hercules aircraft are to be part of a new multi-national stabilisation force bound for the Congo. At the time of writing, one Hercules had already returned to Lyneham from Africa and a second was planned to leave on a similar mission. Are you Over the Hill? You may be headed that way if . . .
At the breakfast table, you hear snap, crackle, pop and you're not eating cereal. You wake up looking like your driver's license photo. When you're on vacation and your energy runs out before your money does. When you say something to your kids that your mother said to you and you always hated it. When you step off the curb and look down one more time to make sure the street is still there. The twinkle in your eye is merely a reflection from the sun on your bifocals. Everything hurts, and what doesn't hurt, doesn't work.